Before we left Colorado, Faith had one last Girl Scout camping trip to go on. 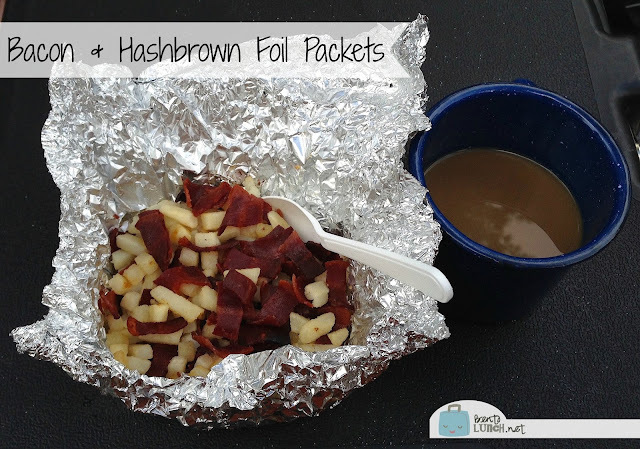 I helped with the food planning since we were trying to finish out some of the food we had in our own freezer and came up with a perfect breakfast for the girls--bacon & hash brown foil packets. There are two ways to make these--either buying precooked bacon or cooking it yourself before the trip. Since I had about 8 packs of Jennie-O turkey bacon in my freezer, I opted for the second. I diced it at home, cooked it in a skillet and drained it on paper towels to remove the grease. I packed it in freezer bags and we kept it cold in our ice chest. If you were worried about keeping things cold, the shelf-stable precooked bacon would be a perfect substitute. Lay out sheets of tinfoil, spray the center of each with a spritz of baking spray. In a bowl, combine hashbrowns and bacon. Put a generous spoonful of the mixture in the center of each foil packet. Fold or roll the tinfoil to make sealed packets. Cook over the fire until potatoes are cooked! Eat and enjoy (with coffee as pictured above, or juice like the girls had). I may not really be a camper, but I think I'm getting the hang of the food part! Getting ready to head out on a camping trip next weekend. Foil packets will be so handy!